Colibri is a free software (GPL), based on python and Django. It’s not feature complete, but it actually forward mails. 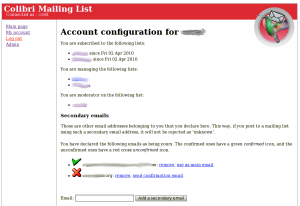 From the web interface, people can (un)subscribe and configure their accounts. I believe it’s a very useful django app. * Is there a discussion group for this? There’s no discussion group or mailing list yet. I will open something if enough people are interested, of course. Meanwhile, I can be reached on the freenode IRC network as orzel, channel #freehackers. Bounces are handled, but not as well as I would like, and it is not tested enough, this is the meaning of issue 651. “not as well” means that a bounce will be removed from the incoming spool (no loop) and not be forwarded back to the mailing list. I want those to be available in the admin interface, with proper stats and actions to be performed by the admin (onhold, remove, reset..). Concerning single-link opt-out, it’s not possible yet, but definitely a good idea. Do you mean a single, ‘generic’ url like domain.com/my@mailing.list/unsubscribe or a user-specific one ? 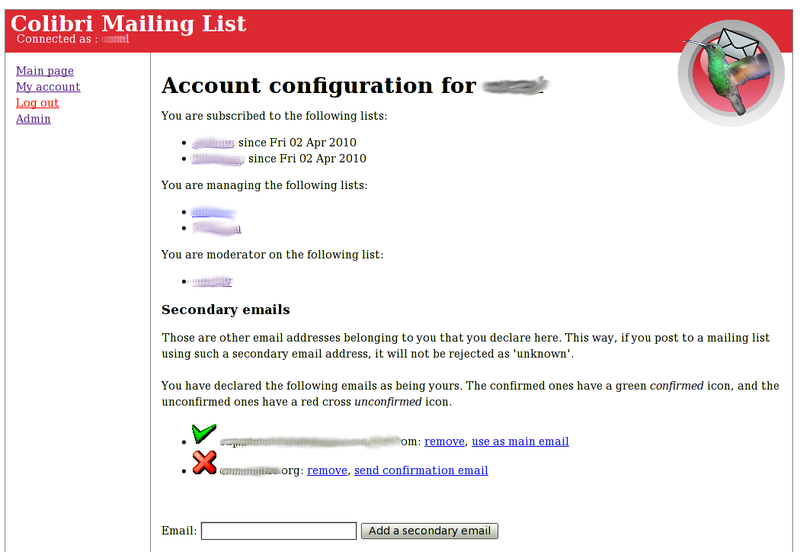 The first option will still require the user to log in, and the second one means more work for the daemon (we need to generate a different mail for each user).